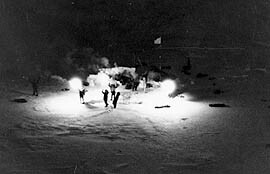 In 1986 during the polar night from January 29 to March 7 the participants of the polar Expedition of the Komsomolskaia Pravda newspaper under the leadership of Dmitry Shparo joined by a ski track the two drifting Soviet stations SP-27 and SP-28, after traveling 700 km in 37 days. This unprecedented crossing proved the possibility of traveling over drifting ice during the polar night. Dmitry Shparo recollects: "When we started our trip from SP-27 to SP-28 at the end of January, we all thought that as we are traveling over the white snow there should be at least some light, even under conditions of a polar night, when there is no moon and no starts, when there are no northern lights. We all were educated people, there were scientists among us, but we always were thinking like this. But this was our mistake. If there is no light from above the snow as a reflecting surface also does not work, as there is nothing to reflect. That's why there was the pitch darkness. If you go without switching on your lantern you would not be able to distinguish a man who is at arm's length. You know that there is a man in front of you, you hear the noise of his skis, but you can see neither his skis, nor your own skis. That's why such expedition is rather a terrifying thing". 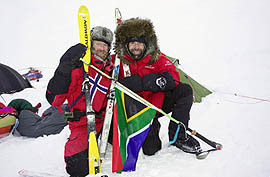 The world renown explorers: Norwegian Borge Ousland and South African Mike Horn started their expedition from Cape Akticjesky on January 22, 2006 and reached the North Pole on March 23, 2006. The skiers did not manage to keep within a full winter expedition, as starting from March 21 the sun is in the sky round the clock.